Over the weekend a photo from Frontier offices, circa October 2014 surfaced. 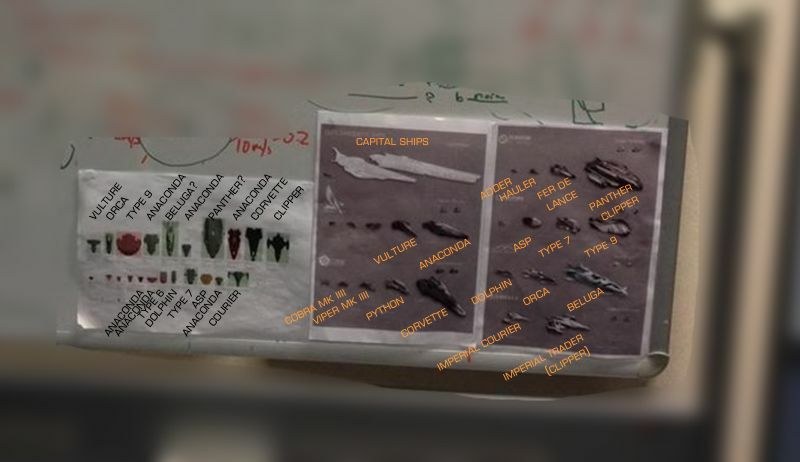 The photo was of a whiteboard concerning audio development, but posted on the corner of the whiteboard was a series of ship concept arts and ship renders. From the concept art, I can identify all but the smallest ships. Interestingly the ships are all grouped by manufacturer. The renders are all top-down. This gives us a clear indication of size, or at least the size Frontier planned. Some of the ships are in their "early" form. The Imperial Clipper was still known as the Imperial Trader and was larger than the final Clipper became. The Courier was in the early concept stage and as we know changed a great deal in implementation. As you can see the Panther and Beluga top-downs show they are both longer than the Anaconda and Corvette. We are fairly certain that large pad is the hard limit of ship sizes and the pad would appear to be approximately 200m x 120m. The Beluga therefore is likely to be the same size as the Imperial Cutter and the Panther is that much larger, so probably very close to the maximum 200m long. That would make the Panther a pretty massive ship! With Horizons 2.2 "Guardians" we are going to get passenger missions, so it follows that the most likely time for the Dolphin and Beluga Liner to sail into the game is in this version. When will we see the Panther Clipper? Well 2.1 would be a nice surprise, but my bet is the ship and maybe some others of the same size class, are being held back for something special in 2.4. Currently passing cargo is a matter of eject-n-scoop between two ships, but with advent of super-heavy traders in the game maybe we'll see a ship-to-ship docking mechanism added for cargo (and passenger?) transfer direct. This would allow for player-to-player cargo transfer and ships as large as the Panther could visit tiny outposts like Hutton Orbital and be unloaded by a group of Type 6 transports. It would also allow for the transfer of passengers to ships. Maybe you can take some guests to that wedding barge? Multi-Crew lets you fly in the same ship with friends, which will up the intensity and camaraderie levels of a joint mission even further! You’ll be able to share and alternate control of weapons systems, turrets and flight duties to multiply your effectiveness. Even to the extent of piloting a ship-launched fighter and working in combination with the mothership. 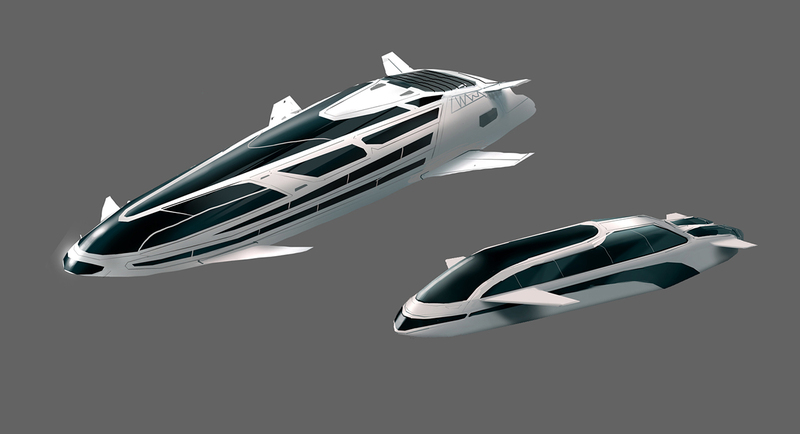 It’ll be especially useful in some of the very large trading ships coming in season two. Now the original Elite, way back in 1984 didn’t have any really big trade ships – the Anaconda was the largest, with the smaller Boa and Python in the mix, but there were some super-massive traders in Frontier and Frontier First Encounters. What were they? Well, between Elite 1 and 3 the roles of these ships juggled somewhat. In Elite the Boa was smaller than the Anaconda, but by Frontier First Encounters (Elite 3) the Boa was the bigger ship. The Panther Clipper; described as a “behemoth” in Elite 2 wasn’t the biggest in Elite 3 – that was the Lynx Bulk Carrier. How big was that? Well the Panther had a 2100T cargo capacity compare to the Lynx’s eye-watering 6000T cargo hold. A monster! So what will the “very large trading ships” coming to Elite: Dangerous be? We have been teased 3D renders of the Panther Clipper (called Panther LX in this incarnation) very early on during the Elite: Dangerous KickStarter, but it has been radio silence since. Currently the biggest trade ship in ED is the Imperial Cutter which can carry (with shields) 728T of cargo. That’s only 35% of the original Panther’s capacity. Could it fit on the pad and carry that much cargo in ED? Well, no. Based on the maximum dimensions of all ships, the Panther LX could be up to 192.6m L x 115.3m W x 33.4 m H and fit through the access corridor and land on a large pad. That is around 4% larger overall volume than the Imperial Cutter and would (at a 4% increase) give the Panther a 1540T hull. That would give an approximate cargo capacity of between 670 to 1104T – estimating a make-up of three Class 8, one Class 7, two Class 6, two Class 5 and one Class 4 internals. Huge. Something we’ve not seen, even hinted at, is the return of the Boa. If based on Elite 3 this would be double the size of the Anaconda (in capacity) so would carry 936T of cargo (3 x C8, 1 x C7, 1 x C5, 1 x C3) not to be sniffed at! 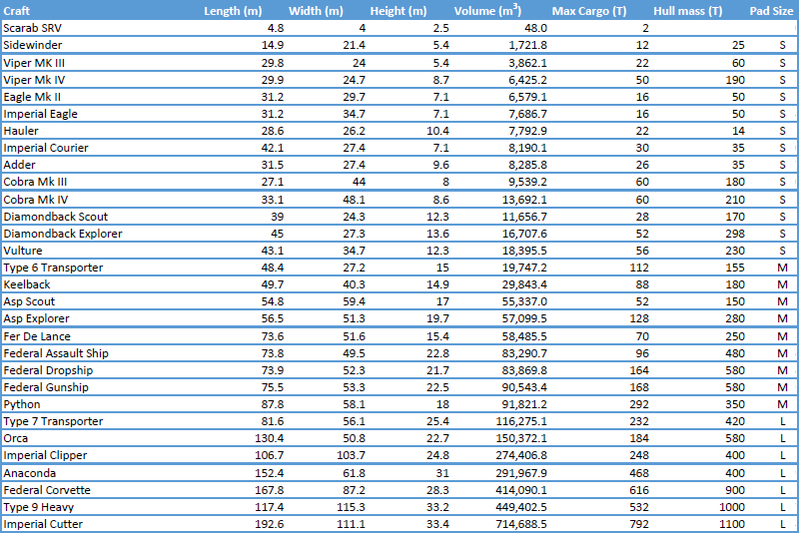 Based purely on volume, it could be smaller than the Corvette, say 160x114x32m and be twice an Anaconda’s capacity. Frontier could also pull something out of the bag we have not seen before. But we'll know soon, because they are coming this year to a game near you. Frontier have rather quietly announced the next major update to Elite: Dangerous after Close Quarters Combat Championship (1.4) will be called "Ships"
After CQCC in September, but before "Horizons" which is being released in "Holiday season" (late November to early December), so some time in October or early November. The update will take the number of unique ships (excluding variants we assume) to over thirty. We already know Horizons will bring the Cobra Mk IV and 1.4 will add the Dropship Mk II, the Federal Gunship and the Imperial Eagle. The Panther Clipper - large trade ship. This ship from the earlier Elite Frontier game had huge cargo capacity and formidable defences. The Imperial Cutter - a large ship which we know little about, but would speculate is an Empire equivalent of the Python, somewhere between a Courier and Clipper or perhaps larger than a Clipper? The concept art we've seen appears to show what became the Imperial Clipper, so will we see a Cutter or not? The Federal Corvette - the largest flyable ship to be in the game, almost a third larger than an Anaconda. A slow moving weapons platform. 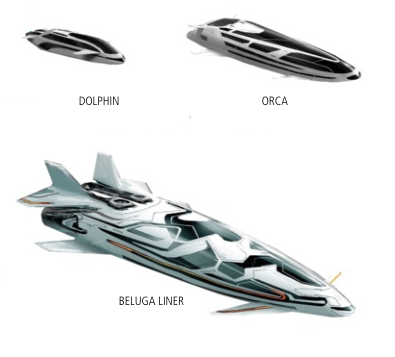 The Dolphin passenger vessel and Beluga Passenger liner - which with the Orca, are Elites passenger transport vessels. With the introduction of these passenger ships it would follow that passenger transport would become a career path in Elite as well. Something many have waited for. Big on the wish-list is ship-in-ship transport and deployment. With SRV's being launched from all ships in Horizons, the idea of a "launch bay rack" for Class 6 & Class 7 internals sounds more plausible. And rather appealing.